What does the Iberian wolf think about renewable energy? Three packs of wolves range across the mountains above the Minho valley in northern Portugal, just beside zones marked out for the biggest wind farm in Europe. 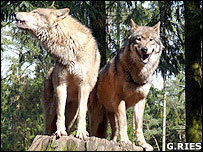 The wolves had to be tracked by satellite to see what they got up to once the building work started. Not surprisingly, they were frightened off. As the first wind turbines were finished and a measure of peace returned to some of the hilltops, they started to move tentatively back into the area. The wolves, an endangered species, are witnessing a monumental change in the way Portugal is powered. They will have to get used to these turbines and more, because 120 are being installed at Alto Minho. The project is backed by the French electricity company, EDF. The government wants 45% of the country's electricity to come from renewables such as wind, hydro, and solar by 2010. And that's just a start. 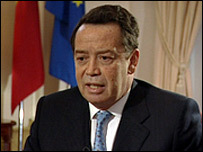 "This challenge will create a new industrial revolution," Portugal's economy minister, Manuel Pinho, told the BBC. "The countries that move first will have an advantage," he added. Just by way of comparison, the UK's ambition is to raise the share from renewables from 5% to 10% over the next three years. If Portugal's revolution succeeds, the country will rank with Sweden and Denmark at the top of the European league for renewables. The economy will be transformed and so will the landscape. Portugal has a head start because in the past it developed a large amount of hydro-electric power. Now all useful rivers are to be dammed, which means that ten new dams will be built. Several more are being upgraded. An extraordinary solar power station, the biggest in the world, is changing the face of the Alentejo, Portugal's sun-baked southern plain. 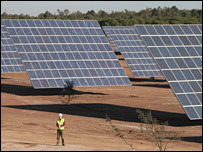 2,500 solar trackers, nearly as big as tennis courts, are being lined up in rows across a 130 hectare site. And Alto Minho is just the latest in a string of wind farms which will crowd mountain tops down the length of the country, supplying 12% of its electricity. 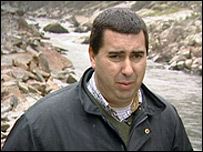 "We don't have oil, we don't have coal," points out Jose Miguel Oliveira, the manager of Minho Valley Wind Development. "So we have to use what we have and wind is one of the resources we have." It's true that if you include transport and heating, Portugal depends on imported fossil fuels for 85% of its energy needs. But even in a country which has embraced renewable power there are misgivings about the rapid rate of development. 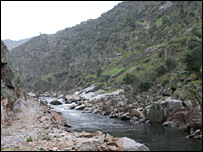 One controversial project is the dam earmarked for the River Tua, inland from the city of Porto. A 25-mile lake will be created along a valley famous for its juniper and cork forests. Joao Branco from an environmental pressure group, Quercus, showed me the site, pointing out that wolves visited this area as well, along with Bonelli's eagle, black storks and otters. He says they should all be protected. "I think there will be enough popular protest to stop the construction of the dam," he added. Already, builders have started blasting a road though the rocky Tua gorge, where the 100m high dam will be erected. The work was suspended after Joao's group found that planning permission had not been granted, yet. The campaigners are torn between their concern about climate change and their love for the wildlife. "We should have renewable power but not at any price," Joao says. Yet the dams are essential if Portugal's ambitious plans for renewable energy are to be fulfilled, because hydro-electric power is being relied upon to keep the Portuguese grid stable when the wind stops blowing. While wind turbines are spinning, any excess electricity will be used to pump water from below the dams to the reservoirs at the top. The stored energy can be released to balance the grid at critical times. Seven of the new dams are designed specifically for pumped storage. "The combination of wind and water is really the centrepiece of Portugal's energy strategy," explains Manuel Pinho. He expects that by 2020 the proportion of electricity generated from renewables "will be between 55% and 60%". At least the creation of reservoirs can have helpful side-effects in a country where water is precious. Driving to the huge dam at Alqueva in the Alentejo you pass grove after grove newly planted olives, all neatly interlaced with irrigation hoses. The dam, opened three years ago, was hugely controversial, but farmers have been taking advantage. Tourist developments are starting and a new airport is planned. At Alqueva, I asked Antonio Mexia, head of the main electricity company, EDP, about objections to dams. "Generally environmentalists don't live near the dam," he answered. "The local people tend to be massively in favour." Meanwhile, Portugal is trying a new way of generating electricity which has no impact on the countryside, but might worry surfers. 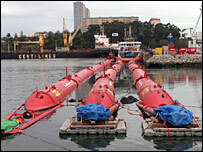 Three British-designed Pelamis wave generators are waiting on the quayside in Porto to be towed out to sea. The power produced will be tiny, about the same as a big wind turbine, but it will be the world's first commercial wave farm. "If you look at the coast and the Atlantic, there's ample opportunity to site wave farms in Portugal," predicts Ian Sharpe, in charge of Portuguese investment for the Australian financial group, Babcock & Brown. He is responsible for the Pelamis project and is planning to install 500 wave machines off Portugal, if the first attempt is a success. "We'll run out of suitable locations for wind farms in Portugal, in terms of onshore wind, so we see wave taking over from wind." Maintenance engineers at Alto Minho have no doubt about what renewable energy means for them. "Other factories are closing," explains Marco Lajoso who found a job with the German turbine maker, Enercon. "We have, solar, we have waves, we have wind. That's the future," he adds. Several thousand jobs have been created in northern Portugal, building and maintaining wind farms. New factories are being set up with state help. It is a deliberate strategy. Seeing that most equipment might have to be imported and that manufacturers in Germany and Denmark were overwhelmed, the government set about creating a home-grown renewables industry. To Portuguese politicians, this seemed a dream formula: cure the climate, cut out imports and create jobs. It was all or nothing. "The cost of inaction is tremendous," Manuel Pinho warns other countries from his office in the elegant centre of Lisbon. "You have to get moving as soon as you can." The world, and the wolves, will be watching Portugal's progress, to see how well the formula works.